Child Car Seat Accessories - Which? What child car seat extras can you buy? Are they safe? We investigate the 5 Point Plus Anti Escape System, mirrors, seat protectors and more. There are numerous car seat accessories available to buy from the major baby retailers and online. But we'd strongly advise you to be careful what you go for. Car seats are crash tested in the way they are designed to be used, and adding accessories such as chest clips, or seat covers that aren't approved by the manufacturer, could compromise the seat's safety and/or void the warranty. If you're looking for a child car seat, sign up to Which? to find out results from our essential crash tests and ease-of-use assessments in our child car seat reviews. What do the car seat manufacturers say? We asked Britax, one of the leading car seat manufacturers, for its view on seat accessories. A spokesperson said: 'We invest significant time in the research, development and testing of our own manufactured accessories which accompany our child car seats. This ensures that the accessories offered enhance the consumer experience by offering added comfort and practicality, but doesn’t interfere with the crash performance of the car seats. Here's our view on some of the accessories on the market. The 5 Point Plus Anti Escape System has been on the market for some years now, but since the beginning of 2016 comes integrated into all Cosatto's Group 1 and 1/2/3 car seats – so the brand clearly agrees with its benefits. It's basically a fabric harness that fits over the five-point harness of the child seat, reducing the size of the arm holes to make slipping arms out of shoulder straps much harder. We asked a parent to try one out in a first look review, and it stopped her child's Houdini-esque escape attempts quickly. She also found it easy to fit. She did think the reduced arm holes made it a little more awkward to get her child into the car seat, but found that it didn't really make much difference to getting him out. This is of key importance in case you, or someone else, needs to release your child quickly from a seat after a crash. The 5 Point Plus Anti Escape system is not actually officially endorsed by any UK child car seat manufacturer other than Cosatto – although the maker says that other brands' customer services recommend it to parents. Speak to the manufacturer of the car seat you own to see what it advises before buying one to go with your child's car seat. The BeSafe belt collector holds the shoulder straps in place to make it harder for a child to slip their arms out. It isn't a chest clip, as you slide it on the shoulder straps and slide it off. It is only approved for use with BeSafe harness seats. These are clips that attach the shoulder straps together to make it more difficult for a child to escape from their harness, and are used in the US. Under current UK regulations for child car seats (R44.04), a car seat sold on the UK market must have a single release mechanism. This means that a car seat with chest clips attached could be considered not an appropriate restraint. UK law dictates children must travel in an appropriate restraint. However, R129 has since been updated to allow the use of chest clips. 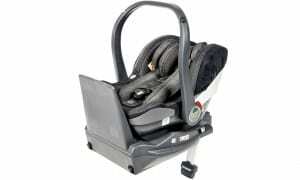 One of the first i-Size car seats to feature this is the Maxi-Cosi AxissFix Air. It has a chest clip to hold the two built-in air bags in place. Read our Maxi-Cosi AxissFix Air review to find how this car seat fared in our tough crash tests. Adapting your car seat in any way could mean it doesn’t perform as it is designed to do in a crash. A chest clip could lengthen the time it takes to get your child out of their seat after an accident, when getting them out quickly could be essential. We would include the Houdini Stop, a fairly well-known device that has been tested in Australia, in this category. It is not approved for use in the UK. A car seat protector may seem like a good idea. They're designed to protect your back seat from dents or scratches that could potentially be caused by your child car seat, but in reality, they could compromise the safety of the car seat. Additional padding or material between the seat and its fixing could mean the seat is not as firmly fitted as it should be, which could have serious consequences in a crash. Even if the protector is claimed to have been crash tested, it certainly won’t have been tested with every car seat. If a manufacturer sells one to go with its car seat, it should have been crash tested with it. But if it's a generic cover we'd recommend contacting the manufacturer to make sure it's approved for use with your car seat, or it could invalidate the seat’s warranty. As with car seat protectors, some manufacturers make interchangeable car seat covers for their products. 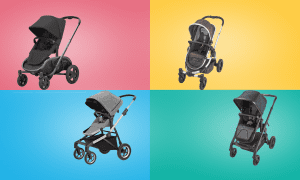 For example, Maxi-cosi and Britax both have summer covers for their seats, which are designed to be cooler for your baby or child in the hotter months. These are fine to use, as they have been tested with their specific seats. Generic car seat covers are also available, but these may not have been tested with your particular seat, so always check with your car seat manufacturer as to whether they would approve the use of a car seat cover with their product. When your child is in a rear-facing car seat, you can’t see them when you are driving. So it’s understandable that many new parents buy mirrors that attach to the back seat's headrest to get a view of their baby from the rear-view mirror. These mirrors are popular, but many safety experts feel they are a distraction and we wouldn't recommend using them. This is because trying to make eye contact with your little one, or see what he or she is up to while you're at the wheel, stops you concentrating on your driving. Also, in an accident, there is a real danger that the forces of a crash would cause the mirror to come loose and hit someone. Some manufacturers make cupholders that clip on to the side of the seat, and some seats have cupholders built in. It's useful to have a secure place for a child’s drink to go so that he or she can reach it, to save you pulling over or engaging in dangerous driving while trying to retrieve the bottle. We would advise using one recommended by the manufacturer. Of course, a cup in the car could fly free in an accident and a cupholder may not prevent this, so bear this in mind. 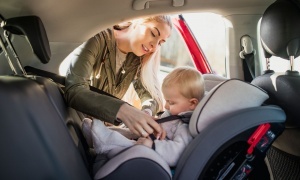 Infant car seats tend to have built-in sunshades, which are not only useful for keeping the sun out, but also provide a layer of protection from flying glass if you're in an accident. If you want sunshades, try to choose ones made by car seat manufacturers, as they should have had some level of crash testing. Make sure any you choose are securely attached, especially as the suction pads could fall off or be pulled off by small children and become a choking hazard. If your child has a tendency to fall asleep on long car journeys, then you might be tempted to buy a head support band to stop their head from flopping forward and potentially straining their neck. Commonly found on Ebay and Amazon, these adjustable headbands are claimed to hold your child’s head in place comfortably when tied around the top of the car seat. In theory, it’s a good idea. But most on sale are one size, leaving some parents complaining that the head support is too small to fit round the top of their car seat. Other parents have said it’s too big and slips down, which can be dangerous, especially if it happens while you’re driving and your back is turned. We wouldn’t advise using these. These are blankets or swaddles that have harness holes cut out, so you can wrap them round your baby and still buckle them in. At the risk of sounding like a broken record, unless they are recommended by the manufacturer of your car seat, we think you should steer clear. Even with blankets that are recommended, be very careful that the harness is tightly done up. This is for the same reason why you shouldn’t dress your child in bulky winter coats. Although you may feel that you’ve done the harness up tightly, the soft padding of a coat will compress in an accident. As a result, the harness straps will be looser than they should be, which could expose your child to higher forces in a crash. If you are worried about your child being cold in the car, dress them in several thin layers, and then you can wrap a blanket around them once the car seat harness is done up. To see the car seats we recommend, visit our best car seat reviews.